Labor's 2013-14 Federal budget deserves a close look. The coverage of budgets is invariably an attempt to find the narrative - some overreaching story which apparently explains what has happened and what is coming in the next year or more. Tonight this Labor Government makes the choice to keep our economy strong and invest in our future. To support jobs and growth in an uncertain world. This could be cut and pasted and used in any future (or past) budget speech regardless of party, year or state of the economy. For the most part the political narrative has been written as well. This is the final Swan budget, the Swan song, the attempt to lock in Labor's legacy. No budget is ever really a political game changer, and for the Government this budget comes very much in the shadow of last year's. A year ago the narrative was about a surplus - the path to surplus was clear and it was also writ in stone as a holy good. This year, if there is any real narrative beyond the usual humdrum, it is that we might finally be facing up to the reality of the post-GFC world. The aid budget will grow by $518 million from last year, reaching almost $5.7 billion dollars, or 0.37% of Gross National Income (GNI). ...the Foreign Minister went out of his way to note the strength of the community campaigning, and Parliamentary lobbying, that led to foreign aid being increased, when many other Government programs are being cut. ...Second, there was a bigger than expected increase in funding to Water, Sanitation and Hygiene (WaSH) programs – a 70% increase from $164 million last year to $279 million in this budget. ...The Government also announced a commitment to invest $391 million over the next for years to accelerate progress towards achieving the Millennium Development Goals in Asia and the Pacific – targeting, particularly, MDG 1 on hunger, MDG 2 on education and MDG 5 on maternal mortality. After all the rather mindless carry on about having a surplus or not having a surplus and then just how big a deficit it might be, we can at last breathe easy with the knowledge that the federal government will finish this financial year with a deficit of about $19 billion. And that’s actually a fine thing. And so is a deficit of about $18 billion for the next financial year. Substantially smaller deficits this year or next really wouldn’t be worth the economic cost. Much of the mainstream media have chorused that none of this matters because the election result is in the bag for Abbott's austerity Coalition. They seem to acknowledge that the Liberal National razor will cut most worthwhile initiatives if they win. For the rest of us, there are votes to cast in four months time - a chance to vote for meaningful progressive programs. A chance to vote against the cynicism and negativity bred of self-interest and greed. This week we saw a major achievement in Australian policy - the bi-partisan acceptance of an increase in the Medicare levy to help fund the National Disability Insurance Scheme (DisabilityCare). There was considerable activity on social media before Tony Abbott's concession but there has been a deadening silence in the progressive blogosphere since. The disability people got what they wanted: a secure funding source that will partially pay for the NDIS and bipartisan support. 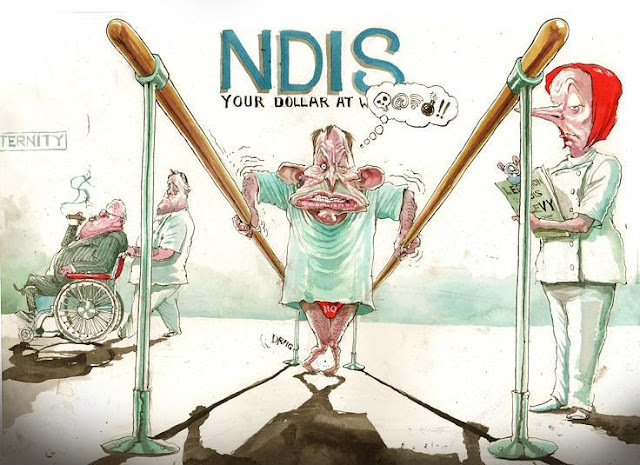 That means the Coalition will find it hard to renege at a later date because they are publicly committed to the national disability insurance scheme. If the conservatives keep their word, the NDIS will be a major legacy of the Labor government, whether it is reelected or not. Abbott's "conditional" support of the levy contained his usual dissembling but once the legislation is passed, he should be locked in. Yesterday Victoria signed up to NDIS, just as we are abandoning the field to the Liberal National Party policy void. Despondency over the polls and government policy failures must not make Abbott's austerity a fait accompli. Schools, climate change and the NBN are just a few reasons to keep up the political fight. If progressive bloggers cannot step up, then it is probably time to archive their blogs and retreat into the twitter ether or a subscription to Foxtel.